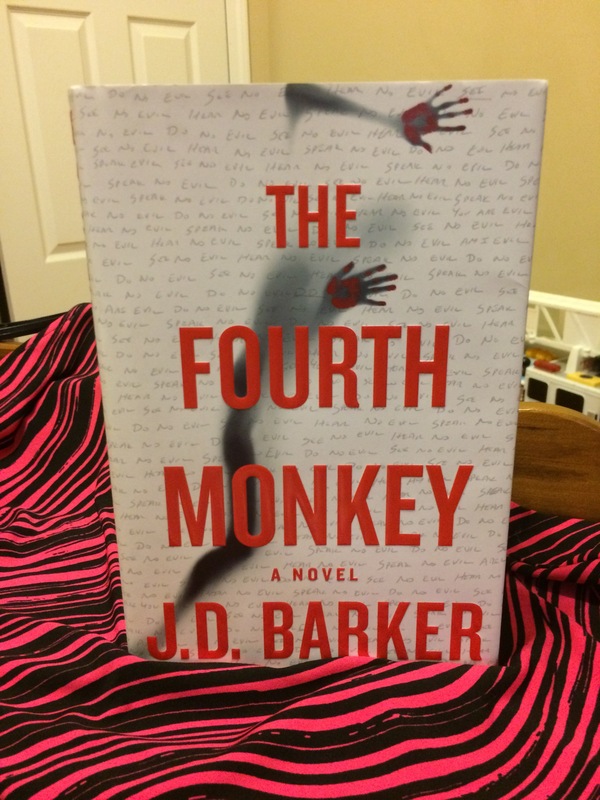 About: The Fourth Monkey is a mystery thriller written by J.D. Barker. It was recently published on 6/27/17 by Houghton Mifflin Harcourt, hardcover, 416 pages. The genres are mystery, thriller, fiction, and suspense. This is book 1 in a series called A 4MK Thriller. According to the publisher’s website, “HMH is an organization rooted in purpose and strengthened by passion. Our values drive our decisions, shape our strategies and shine through in everything we do: Curiosity, Commitment, Effectiveness and Reliability, Learning, Performance, and Best in Class.” Please see below for more information about the author and publisher. My Experience: I started reading The Fourth Monkey on 8/27/17 and finished it on 9/3/17. This book is a fantastic thriller! Unbelievable! What a ride! I love a good puzzle with little bread crumbs and this book has it. I try to read this book slowly and carefully to savour the intensity of the thrill in each page because it’s so good! The writing in the Diary is enchanting and it bewitched me to forgive them when they do bad things. The police force is a delightful bunch. I love their constant banter and humor. I am truly hypnotize when I read this book. This book is told in the third person point of view following Detective Sam Porter, a lead investigator and the only officer to chase down the serial killer for the past half a decade. He and his partner Nash and the task force team are truly a blast to follow. There is no dull moments following Porter and Nash to work. Readers will also follow the last victim, as she struggles with surviving and knowing full well who her killer is. Another task force member is Claire, a youngest detective on the 4MK task force. I like her straight forward attitude and how she deals with men. Readers will also get to read the killer’s diary in the first person point of view starting from his childhood. This book is organized where the police are called out to investigate a death believed to be of the fourth monkey killer. The man walked into an oncoming traffic and was hit by a bus. He has with him the signature box the 4MK uses on his victims. Police believes he was trying to deliver a box to a prominent business man in Chicago. The content in the box inform the police the victim may still be alive. There are multiple stories running parallel in this book with each person actively taking one step closer to solving the case. The chase and plot twists will leave you at the edge of your seats! This book is very well written and organized. It’s definitely a fast paced mystery/thriller full of actions. I had a hard time putting this book down. I love reading the diary. It’s so beautifully written and captivating. I love the humor of the task force. Everyone is likeable. Every chapter ends with suspense and my patience squeeze a little having to wait every other chapter to find out. I love the multiple point of views. I love how the story is based on the 3 wise monkeys: See No Evil, Speak No Evil, and Hear No Evil, originated from Japan. This thriller is definitely my best read this year and I highly recommend everyone to read it! J. D. BARKER is the international best-selling author of Forsaken, a finalist for the Bram Stoker Award for Superior Achievement in a Debut Novel. In addition, he has been asked to coauthor a prequel to Dracula by the Stoker family. Barker splits his time between Englewood, Florida, and Pittsburgh, Pennsylvania. (Photo obtained from Edelweiss and Info obtained from HMHCO’s website). ***Disclaimer: Many thanks to Houghton Mifflin Harcourt for the opportunity to read and review. Please be assured that my opinions are honest. I heard it was gory so I was too scared!! This book looks amazing! I love a book that leaves a good trail of bread crumbs along the way to keep you wanting more. Great review! Thanks 🙂 I hope you will get a chance to read The Fourth Monkey. The writing is really beautiful. I have to say I probably wouldn’t pick it up (not a fan of the genre) but your review definitely made me interested enough to try. I’ve seen this one around a lot lately and most people have nothing but great things to say about it. So I think it’s a sign of how good it is! Thanks! This thriller is not scary.. the writing is poetic even.. makes the characters doing bad things not sounding bad haha.. If ever you are looking for a thriller to read, this book is a great one! Have you read the other two books? I have seen the movie Cannibal and it’s interesting. I noticed on Goodreads that there are several books to the series. I hope to read it one of these days 🙂 Who is the author for se7en? I tried to search on Goodreads but can’t find. Thanks Diana. I love the writing in this book and how it’s action packed from the start. A great read, Jasmine and your review was so beautiful. I too love these type mysteries and how captivating they are. Thanks for the lovely share. Thanks Kamal. I hope you are doing well. Welcome Jasmine yes all good, how are you doing.